Located at 6880 Holly Street, the Holly Street facilities serve students in grades PK-5. It consists of a 50,000 square foot two-story brick and block building with 22 classrooms, additional kindergarten and pre-school classrooms, a library, a full gymnasium, an art room, a music/performance room, a cafeteria, a technology lab, a science lab, and administrative office space. The Holly Street Facilities provide physical capacity for approximately 550 students. Located at 5701 Quebec Street, the Quebec Street facilities serve students in grades 6-12. It consists of a 60,000 square foot three-story brick and block structure with 14 classrooms, 3 science labs, a technology lab, a large lecture hall, a full gymnasium, a cafeteria with commons area, and administrative office space. A 10,000 square foot 8-classroom modular facility is connected to the brick and block structure. The Quebec Street Facilities provide physical space for approximately 600 students. 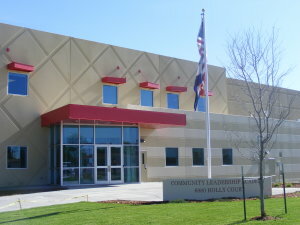 In 2008, Community Leadership Academy completed its $8.8 million dollar facility project and moved out of 16 modular trailers into a new 50,000 square foot building on four acres. Materials that have a low VOC (Volatile Organic Compound) content include the foundation waterproofing, adhesives for the floor base, joint sealants for the tilt-up panels and all of the interior paint. This reduces the quantity of indoor air contaminants increasing the quality of the air. The Thermoplastic Polyolefin (TPO) roof has a solar reflectance index (SRI) of 95. (A good SRI is = 78.) This reduces heat islands, which are thermal gradient differences between developed and undeveloped areas, and minimizes the impact on microclimate as well as human and wildlife habitats. All the access doors are made from recycled steel and have a paint finish that contains 0 VOC’s. The acoustical tile has 55% recycled content, the acoustical grid has a minimum of 25% recycled content and the gypsum ceiling has 5% recycled content. 780 cubic yards (3,159,000 pounds) of concrete make up the wall panels for Community Leadership Academy and consist of 63.6 tons of rebar (1 ton = 2,000 pounds). The concrete tilt-up panels weigh almost as much as one floor system in the World Trade Center Towers did. The panels that make up the gym average 80,000 pounds EACH with the heaviest panel weighing 84,565 pounds. The 2-story section panels, like the one making up Lab 2C, range from 40,000 to 65,000 pounds. The school name was cast into three separate panels using plywood cut-outs that were hand-cut and sanded. Then the edges were wrapped with plastic laminate to give them their “crisp” look. Over 16,000 linear feet, equivalent to 3 miles, of reveal forms were used to create the rustication lines and diagonal patterns on the building. From start to finish, it took a total of 2,815 man-hours of on-site labor to pour and erect the panels. If only one person was working, it would take him about 117 days! The 1,800 square feet of glass on the building exterior weigh 12,600 pounds, which is heavier than some small Orca whales. The 400 square feet of interior glass weighs 1,400 pounds. The 3,900 lineal feet of aluminum weighs 5,265 pounds, which is the same weight as a female African elephant. 96,043 feet, or 18.2 miles, of electrical wire was installed (not including control, fire alarm, security wire, etc. This is the same distance as if 2000 semi-trucks were lined up bumper to bumper. 29,319 feet, or 5.5 miles, of various types of conduit were installed. In 2013, CLA moved its 7th, 8th and new 9th grade students into a modular building located on an eight acre site located three miles from the Holly Street facility. During that school year, the school secured $16 million dollars in bond financing and completed the Quebec Street facility project. Description: Construction of a new 55,525sf, 3-story charter school; including a gymnasium, science labs, lecture hall, kitchen and classrooms. Materials that have a low VOC (Volatile Organic Compound) content include the foundation waterproofing, adhesives for the flooring and floor base, joint sealants for the tilt-up panels and all of the interior paint. This reduces the quantity of indoor air contaminants increasing the quality of the air. The Thermoplastic Polyolefin (TPO) roof has a solar reflectance index (SRI) of 110. (A good SRI is = 78.) This reduces heat islands, which are thermal gradient differences between developed and undeveloped areas, and minimizes the impact on microclimate as well as human and wildlife habitats. The acoustical tile has 43% recycled content, the acoustical grid has up to 63% average recycled content and the gypsum ceiling has 5% recycled content. All exterior walls have a minimum R-value of 20. R-value measures the resistance of heat flow through the walls – the higher the number, the better the insulation factor. In fact, the solid concrete gym walls have a layer of insulation sandwiched in the middle of the concrete! The building incorporates the use of lighting controls and daylighting. Every classroom has translucent panels which bring daylight into the room, reflect off of the ceiling and transfer down to the desks. In many cases, this allows classrooms to operate with natural daylight alone without the need to turn on lights. However, if lights are needed, the instructor has the option to turn on only half of the light bulbs. 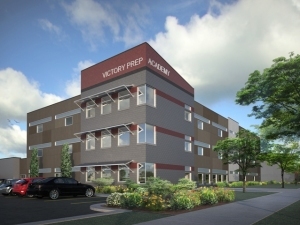 2,820 cubic yards (11,421,000 pounds) of concrete make up the building foundations and floors for Victory Preparatory Academy and consist of 119 tons of rebar (1 ton = 2,000 pounds). Another 265 cubic yards (1,073,250 pounds) of concrete make up the gym walls. 257 tons (514,000 pounds) of steel – columns, beams, joists and steel decking make up the building steel support structure. The 2,344 square feet of glass on the building exterior weigh 16,408 pounds. The 1,436 square feet of translucent panels on the building exterior. The 408 square feet of interior glass weighs 1,400 pounds. The 3,583 lineal feet of aluminum weighs 4,837 pounds.